Vaportek SOS (smoke odor solution). Powerful, dry vapor system. The Heavy-Duty Standalone Cartridge was designed specifically for use in HVAC systems; also recommended for use with high-velocity blowers and fans. Quick Facts: Treats 20,000 ft3 Primarily intended for delivering a fast, high-intensity treatment Non-electric; simply rotate adjustable end caps to control air flow Cartridge rated at approx. 270 hours of use Can attach to a high-volume air mover (stabilizer arms can be purchased separately) Easy portability & lightweight (1 lb.) Approximate Dimensions: 5.75”H x 3.75”D Xactimate Codes: CLN DODRM, CLN DODRME, & CLN DODRMEM Only available in 3X Industrial & S.O.S. Specifically formulated for smoke odors. Has rotating end caps on each end. Treats areas up to 20,000 cu. ft. 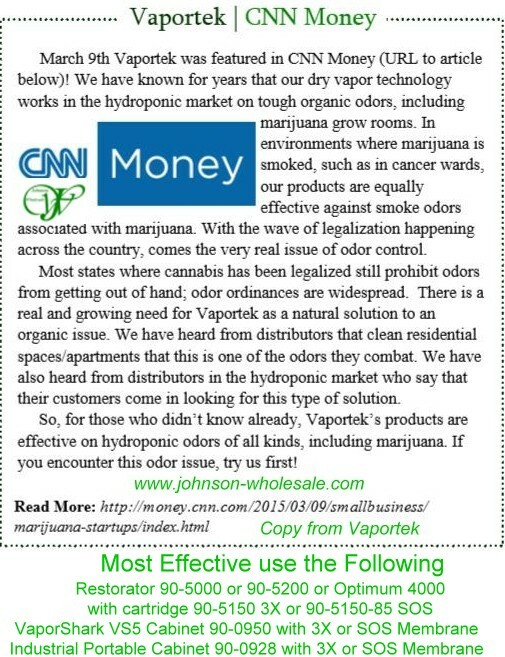 Gardening hydroponically and/or in traditional large-scale indoor or home environments can release odors. Humidity, the use of fertilizers and other nutrient solutions, as well as organic matter and bacteria are typical causes of these odors. Measures can be taken to reduce odors, but often times they persist. To combat grow room odors, Vaportek’s safe, environmentally friendly treatment systems are easy to use and do not adversely affect people, plants, or pets. Our technology will not affect the taste or smell of your plants!